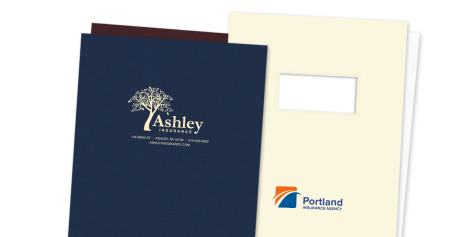 Use these custom printed report covers to add a touch of sophistication to any policy, report or presentation leaving your agency. 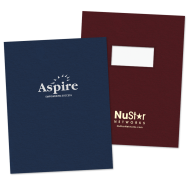 These 1 and 2-piece report covers, were designed to work with any popular binding method, including: VeloBind®, plastic combs or wire binding. Our quality report cover stocks are available printed in 1, 2 or full color, or foil stamped in gold or silver. A well-crafted report cover is a finishing touch that shows attention to detail and the desire to highlight your work. Adding custom printed report covers to your reports will make a big impression and will add value to the perception of your work. 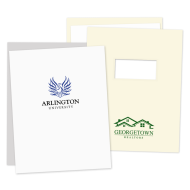 You can choose from a variety of imprint styles or send us your agency's letterhead and we will design your report folders to match your imag – at no additional charge. Our most popular 1 and 2-piece report covers were designed to work with any popular binding method, including: VeloBind®, plastic combs or wire binding. 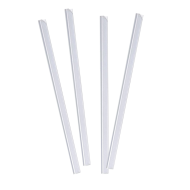 Our slide-on spines are a simple and inexpensive alternative for binding small amounts of documents. They are compatible with our 2-piece and wrap-around report covers. Order your report covers for your insurance agency today!